The new JCB 18Z-1 compact excavator features all-steel bodywork for maximum impact protection and is backed by a two-year/2,000-hour warranty. JCB North America announced the availability of two new compact excavators designed to meet the needs of construction, landscaping and rental customers. The largest of the two machines is the 19C-1, a 4,211 lb. (1,910 kg) conventional tailswing model. The smaller 18Z-1 has an operating weight of 3,856 lb. (1,749 kg) and is JCB's first zero tailswing machine in the 1 to 2-ton excavator class. The 18Z-1 and 19C-1 share a common undercarriage with machined faces for optimal fit and extended component life. A revised idler design delivers improved ride quality and reduces track stalling in loose material. Additionally, the redesigned dozer blade, with easy-to-install dozer wings, is available with standard arms or optional long-reach arms that enable digging close to the machine. Tie-down points are built into the frame and positioned to ensure that ties do not damage the rubber tracks. Improved rubber tracks are standard; steel tracks an available option. Owners of the JCB 18Z-1 and 19C-1 compact excavators will benefit from simplified maintenance requirements and easier servicing. A 23.1 hp (17.2 kW) Perkins diesel engine is accessed via a rear counterweight that swings away to reveal the engine bay and battery. A separate door provides access to daily check points. Boom and dipper pins have 500-hour greasing intervals for reduced downtime. All body panels are constructed of steel, for enhanced protection, and side panels provide access to the cooling package, the valve block and tanks for hydraulic fluid and fuel. The JCB 18Z-1 and 19C-1 use a next-generation, four-plate boom and dipper design. Two dipper arm lengths are available: 3 ft. 1 in. (.9 m) or 3 ft. 7 in. (1.1 m). The 5-ft. 11 in. (1.8 m) main boom features a top-mounted ram to protect the hydraulic cylinder. JCB compact excavators enable use of a wide range of attachment brands. 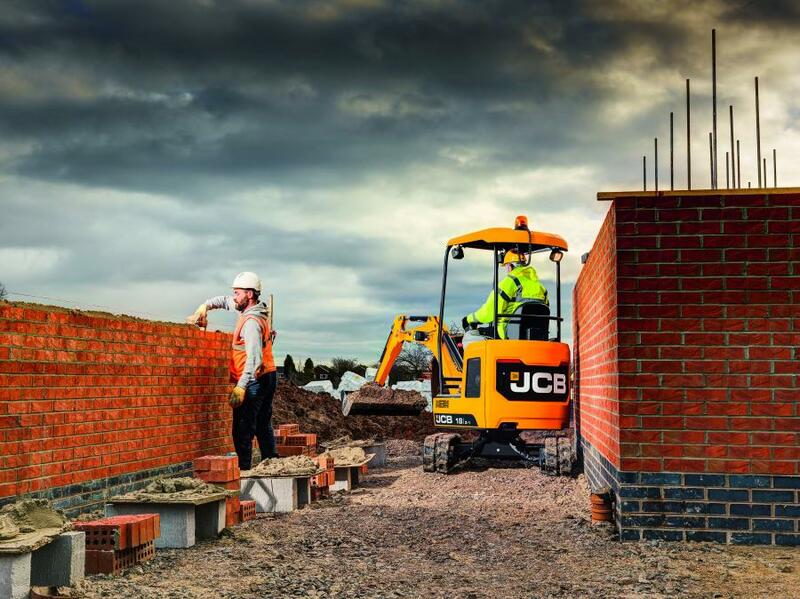 The JCB 18Z-1 and 19C-1 compact excavators feature improved stability and are among the safest on the market. The cab and canopy structures provide more interior space — with more leg and shoulder room — and are ROPS (rollover protection system)-compliant. An improved seating position contributes to better all-round visibility. 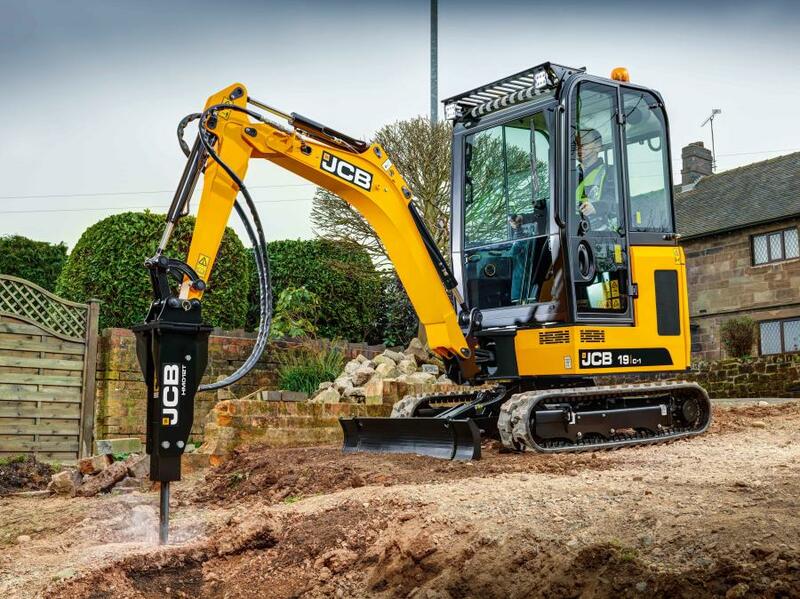 Additionally, both models are equipped with JCB's 2Go selectable hydraulic cut-out system as standard.